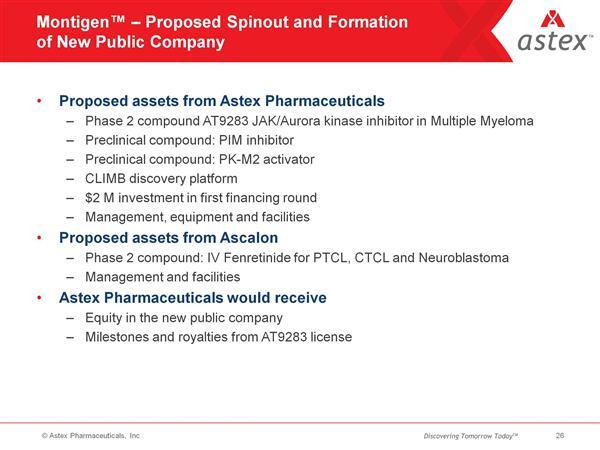 ASTX has announced that they will be spinning off some of the assets from the Supergen-Astex merger, along with certain assets from Ascalon International to form a new company to be called Montigen. Click here for a business plan summary outline with more details about Ascalon assets, plans, timelines, and funding requirements. 8/21/2011 SUPG 2q2011 earnings conference call (first mention of spinout) - click here for my notes. 9/12/2011 Rodman and Renshaw webcast by ASTX - click here for my notes. 9/13/2011 Rodman and Renshaw webcast by Monitgen - click here for my notes. 9/21/2011 UBS webcast by ASTX - click here for notes. 9/27/2011 Jefferies webcast by ASTX - click here for notes. 10/21/2011 BioCentury webcast by ASTX - click here for notes. Navigate through the slide deck before to learn more about the proposed company and its assets. These slides are from the presentation by Monitgen's management team at the Rodman and Renshaw conference in September 2011. AXL Kinase. 2010 10k: "thirteen patent applications, having projected expiration dates ranging from April 11, 2028 to February 8, 2030, pending in the jurisdictions of the U.S., the EPO, Australia, Canada, China, Japan, Korea, New Zealand, and Taiwan."